Robert Bolt’s prize-winning period drama A Man for All Seasons (1966) makes its Blu-ray debut from Twilgiht Time. 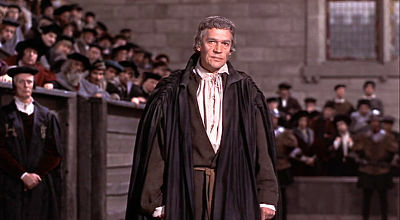 The film is brought to the screen in sterling style by the great Fred Zinnemann (From Here to Eternity), with the sublime Paul Scofield (The Train) starring as Sir Thomas More, wit, politician, martyr, and man of conscience. Refusing to go against his own beliefs by signing an oath declaring Henry VIII (Robert Shaw, Jaws) Supreme Head of the Church of England, More is a tragic hero with all-too-human attributes. The film also stars Orson Welles (The Stranger), Susannah York (Sands of the Kalihari), John Hurt (Tinker Tailor Soldier Spy), and Vanessa Redgrave (Anonymous). The production features Georges Delerue’s memorable score, and won Academy Awards for Best Picture, Best Actor, Best Director, Best Adapted Screenplay, Best Cinematography (Ted Moore), and Best Costume Design (Elizabeth Haffenden, Joan Bridge).